Most of the information for this post is already available in the motorcycles section of my website, but since I seem to be on a roll regarding Eastern Bloc motorcycles I felt it was necessary to include IMZ/KMZ. This is also a prudent place for the inclusion, as my next few pieces will deal primarily with machines that were only produced in the postwar era. For more information on Ural and Dnepr machines visit my M-72 section. “It’s a 1953 M72. 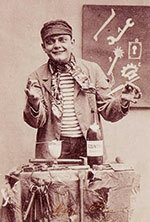 Russian, from the Irbitsky Moto Zhavod”. “It’s a 1953 M72. Russian, from the Irbit Moto Zhavod”. – real conversation with a “master motorcycle mechanic”, 2011. Bayerische Motoren Werke AG (BMW or BMV) began in 1917 after the restructuring of the Rapp Motorenwerke aircraft engine company. At the end of WWI a scant year later they were forced to stop aircraft engine production by the terms of the Versailles Armistice Treaty, and the company fell into some obscurity for half a decade; they survived by turning their equipment over to the more mundane manufacture of industrial engines, agricultural machinery and office furniture. But the treaty restrictions finally began to relax and in 1923 BMW began building motorcycle engines. At first their production was focused on merely supplying engines for other companies; their M2B15 500cc boxer was designed by Max Friz (who had previously designed aircraft engines for Rapp)as a general purpose portable industrial engine, but it was also used in early Victoria (Nuremburg) motorcycles as well as the Helios motorcycle built by Bayerisch Flugzeug, which soon merged with BMW itself. Once they acquired BF Friz immediately set about reworking the Helios design and came up with the first BMW branded motorcycle, the R32; establishing the boxer-twin, shaft-drive layout that the company would use until the present. BMW produced some 3,090 R32 motorcycles from 1923 through 1926, and they continued development of various models of the boxer twin. Important to this story however was their last side valve production bike introduced in 1938, the R71. The R71 was only produced for about 3 years and production estimates vary between 2,000 and 3,458 units (many records were lost due to extensive damage to the factory during the war and the actual production is open to some debate). A 746cc / 22hp machine, the notable characteristic of the R71 was an oval tube frame which provided greater strength as compared to the conventional pressed steel frames of the time: this meant the machine was more easily able to cope with the additional stresses of a sidecar attachment. At any rate, by 1938 the German Army was requesting both BMW and their rival Zündapp to develop a reliable and sturdy machine for use by light infantry. Zündapp answered with the KS-750 and BMW supplied the R75, an overhead valve 750cc engine mounted on the R71’s tubular frame with a sidecar and two wheel shaft drive: on the urging of the military both companies agreed on standardization of parts for the two machines. R75 production began in 1941 and by the end of the war in 1945 about 18,000 machines were built. Non-aggression Pact – August 23, 1939. 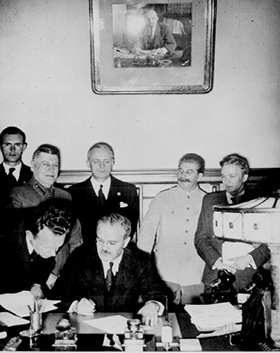 In August 1939 a Treaty of Non-Aggression between Germany and the Soviet Union (also known as The Molotov–Ribbentrop Pact) was signed in Moscow by the Soviet foreign minister Vyacheslav Molotov and the German foreign minister Joachim von Ribbentrop. Publicly this treaty stated that the Soviet Union and Nazi Germany would each remain neutral in the event that either nation were attacked by a third party: behind the scenes a secret protocol was developed dividing Northern and Eastern Europe into German and Soviet spheres of influence- thus instigating the invasion of Poland. But more importantly to us, the negotiations also included the German–Soviet Trade and Credit Agreement where the Soviet Union received a 200 million Reichsmark credit line to be used during the next two years for purchase of capital goods (factory equipment, installations, machinery and machine tools, ships, vehicles, and other means of transport) in Germany. 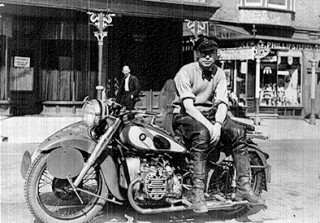 As the BMW R71 was considered a civilian machine at the time- and indeed was already more or less obsolete due to the development of the R75- its designs, manufacture equipment and even BMW engineers are assumed by many to have been included in this plan. “A Russian aero-engineer named Serjukow worked for BMW in Munich from 1935 to 1940. ..The R71 has been selected for manufacture in the USSR. Serjukow was given access to the R71 drawings and parts, since the model was not top of the line… Serjukow shipped several R71 back to Russia for analysis”. Ballard goes on to note that there are still records relating to patent infringements of BMWs by various manufacturers around the world pre WWII, and that none of these refer to infringements by Russia. So the possibility of a legitimate copy is not ruled out by BMW themselves. Despite the Molotov–Ribbentrop treaty, Stalin was fully aware of the threat posed by Nazi Germany and by the end of 1939 the Soviet Union was preparing for war. On 22 June 1941 the Nazis launched Operation Barbarossa and invaded the USSR along a 2,900 km front with over 4.5 million troops. Earlier that same year the first M-72 motorcycles had gone into production at the Moskovskiy Mototsikletniy Zavod (MMZ) and some 1,753 machines were ready for the front lines. 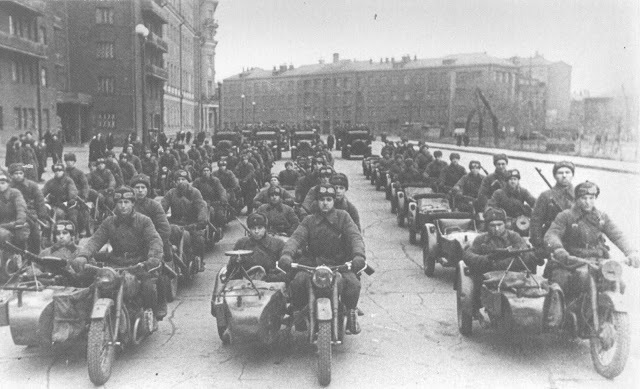 Soviet strategists realized that the Moscow factories were within easy range of German bombers, and almost immediately it was decided to move the motorcycle production facilities and other manufacturing into safer regions. The KhMZ and LMZ facilities which were producing sidecars and other various parts in Kiev and Leningrad were quickly relocated to the city of Gorkiy (now Nizhniy Novgorod) while the Moscow plant was sent into the protection and relative safety of the Ural Mountains. The chosen site was the small fur and tea trading town of Irbit, located in the Sverdlovsk Oblast at the fork of the Irbit and Nitsa rivers. The only substantial building in town was a brewery, which was quickly converted into the headquarters for a rapidly constructed M72 production complex, the Irbitskiy Mototsikletniy Zavod (IMZ). In February 1942 (this date is debated) the first IMZ machines were sent out. 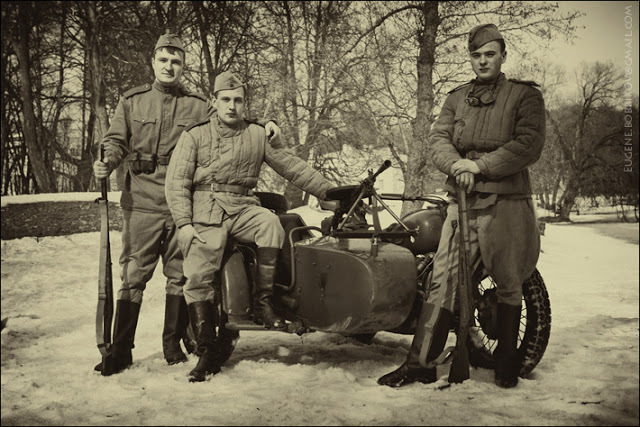 From 1942 to 1945 IMZ is estimated to have produced 7,773 M72 motorcycles, with Gorkovskiy Mototsikletniy Zavod (GMZ) turning out an additional 5,576 machines as well as all of the sidecars. 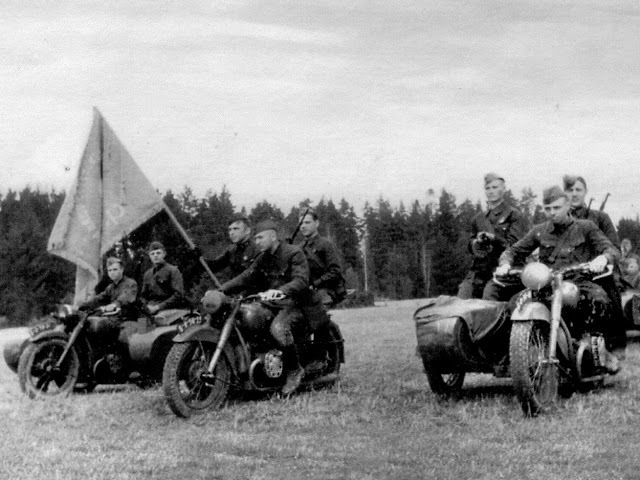 Over the course of the war some 9,799 M72 motorcycles were delivered to the front for reconnaissance detachments and mobile troops with the remainder being used for government and police purposes. In 1946 the sidecar production facilities were moved from Gorkiy to Irbit in order to consolidate the manufacturing: three years later the entire GMZ plant and remaining equipment along with about 100 employees were transferred back to Kiev (Ukraine), forming the Kievskiy Mototsikletniy Zavod (KMZ) which began M72 production in 1951. During this time the motorcycle was available only to the authorities, but once the KMZ plant became operational it took over Red Army production while the IMZ factory began exporting military machines to the People’s Republic of China (along with several other countries). In the mid 1950’s a domestic version was finally released and in 1957 the Soviets transferred an M72 production line to the PRC. By the 1960’s the full production of the Irbit plant was turned over to civilian model production. Meanwhile KMZ began production of the M72N in 1956 and commenced production of the K-750 in 1958. The K-750 had a slightly higher HP output and a more conventional swing arm rear suspension instead of the original plunger type. The M72 in some configuration was produced by IMZ until 1961 and by KMZ until 1964, when it was completely replaced by the K750 which remained in limited production up to 1970. In 1950, the Chinese “Peoples Liberation Army Beijing No.6 Automotive Works” had been attempting to develop a suitable military motorcycle by reverse engineering a German Zundapp KS 500 military motorcycle. As the Soviets began exporting the M72 to China in the mid-1950s the PRC wasted no time in dropping the KS 500 based machine for the tried and tested BMW R71/M72 design motorcycle. Once the production line was established (30 November 1957) the new Chinese bike was renamed the Chang Jiang 750 and began assembly at the state-owned Gan Jiang Machinery Factory (guo ying gan jiang ji xie chang). 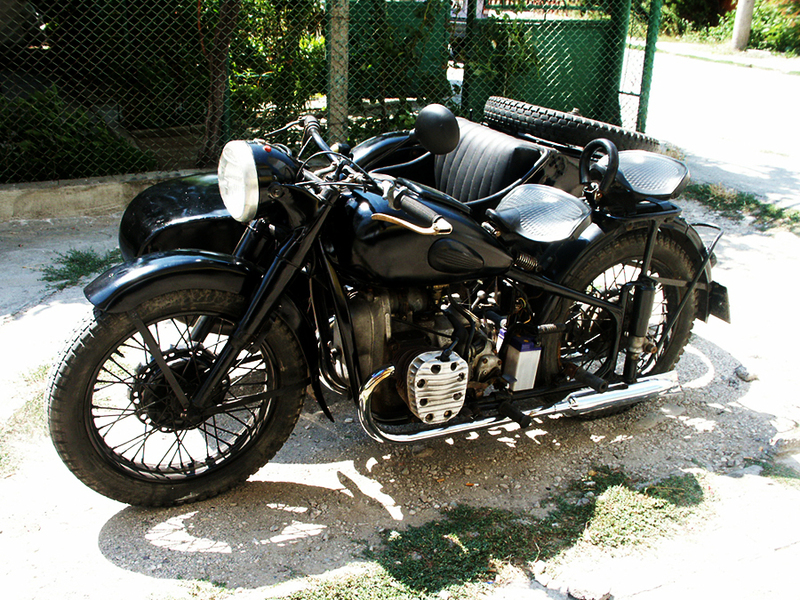 Early motorcycles were built using various imported Russian parts, and even some complete Russian-made M72s were relabeled as Chang Jiang 750. The side valve CJ 750 is still in production today with very few changes from the original designs. 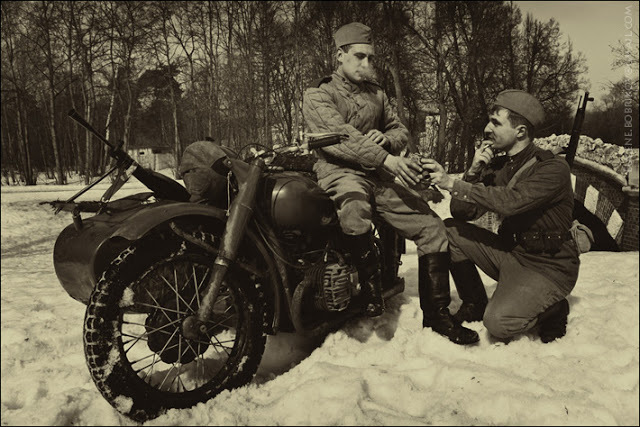 Russia had captured plenty of BMW R75’s during the war, and in fact had produced a side valve 1000cc version (TMZ-53) from late 1941 to 1943 in Tuemen. 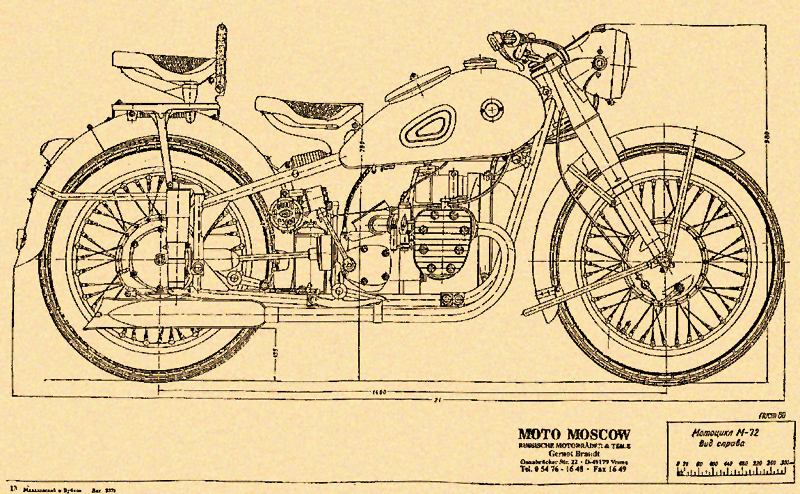 But it wasn’t until 1957 that IMZ released the first Soviet OHV motorcycle, the M52. Not much information is available for that machine (or the later M53) other than some technical specifications -494cc, 24hp, 110km/h. Apparently they were produced in limited numbers from 1957 to 1960. In 1958 IMZ released the M61: almost unchanged from the M72 design other than a 650cc, 28hp overhead valve engine. It was followed by the M62 in 1961 which introduced a better suspension and KMZ inspired rubber block support under the seat, then the M63 with a swing arm frame in 1970, the same year as the final side valve machine (K750) stopped production*. In Kiev they had taken a slightly different path, further establishing separate identities between the two factories which were now known as “Ural” -for the IMZ locations in the Ural mountains- and “Dnepr” for the Kiev plant on the Dnepr river in Ukraine. Although still producing the K750 side valve machines in limited numbers, the factory celebrated the 50th Anniversary of the Great October Socialist Revolution in 1967 by releasing their first OHV engine in the K-650. This engine featured a sleeve bearing crankshaft as found in the earlier German Zündapp KS750. The K-650 was superseded by the MT-9, a machine which quickly gained a reputation for reliability and was available in both solo and sidecar models: the sidecar equipped version featured a new transmission with reverse gear and both utilized an automatic declutching mechanism activated by the foot pedal. Their next model, the MT-10 was the first Soviet motorcycle to feature 12 volt electrics. In 1992 the State-owned IMZ factory was privatized, becoming the Uralmoto Joint Stock Company. In early 1998 the company was purchased by private Russian interests and the government shares were redistributed to investors. In 2000 the company was sold to three entrepreneurs and broken into basic components with the power production facilities, foundry and forge being sold off. In 2004 IMZ had continued new model releases despite drastic product reduction to about 800 bikes a year, and the work force had gone down to around 200. In 2008, the last year I have statistics for, Ural sold 904 motorcycles worldwide. Today they are still in production, and a growing number of dealerships around the world will hopefully herald a resurgence in the companies fortunes. But sadly, by mid 2007 the KMZ factory had all but closed. A store was reportedly available at a new location selling OEM stock, and some parts production was still ongoing but the tooling and equipment were being sold off and the overhead conveyor lines had reportedly been cut up and sold for scrap.